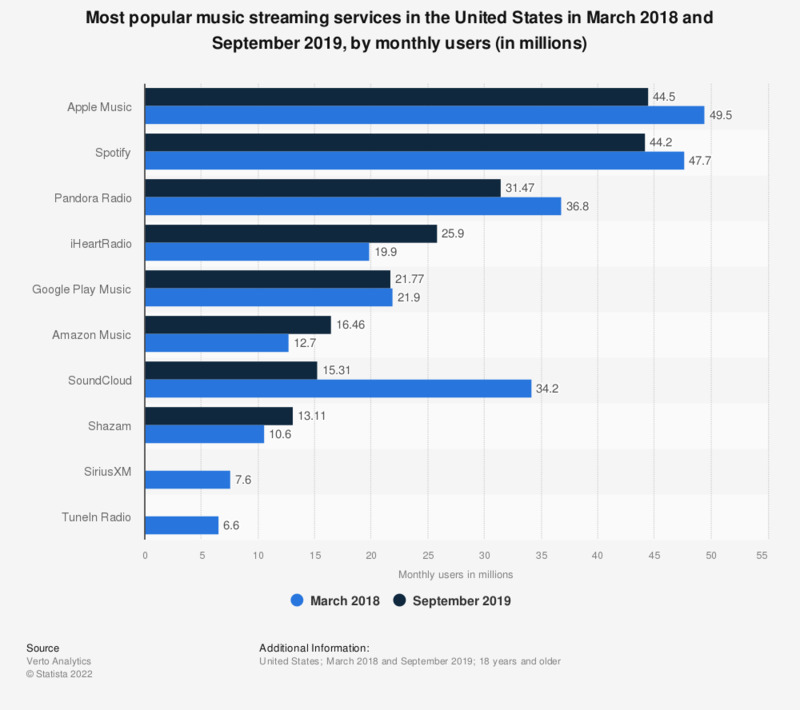 The most successful music streaming service in the United States was Apple Music as of early 2018, with an incredible 49.5 million users accessing the platform each month. Spotify closely followed, with a similarly impressive 47.7 million monthly users. What is a music streaming service? Music streaming services provide their users with a database compiled of songs, playlists, albums and videos, where content can be accessed online, downloaded, shared, bookmarked and organized. The music streaming business is huge, and has sometimes been lauded as the savior of the music industry. The biggest two services are in constant competition for the monopoly of the market. Apple Music was launched in 2015, whereas Spotify has been around since 2008. Other popular streaming services include Deezer, SoundCloud and iHeartRadio. Do artists make a lot of money from streaming services? In short, unfortunately not. Both Apple Music and Spotify have been frequently criticized for the tiny royalty payments they offer artists. Particularly for emerging talent, streaming services are far from a lucrative source of income. Bigger, established stars like Taylor Swift are more likely to regularly make a good amount of money this way. But either way, a track needs to go viral or be streamed several million times before it earns any real cash.